The Wright Wreport: Pommes Frites. This Is How Fries Are Done. Pommes Frites. This Is How Fries Are Done. A paper cone of fries and sauces from Pommes Frites. Photos from Pommes Frites Web site. CRUNCHY on the outside and soft and chewy on the inside. Beautiful golden brown, cut the old-school way. That's how they roll at Pommes Frites, an emporium that deals solely in fried potatoes or – as we erroneously declare in the good ole USA – French Fries, and once upon a time boiling with anger, Freedom Fries. Yours Truly discovered Pommes Frites, one week after my auspicious 'cue birthday lunch at Mighty Quinn's Barbeque (http://www.bit.ly/1vIUrrZ). At the time of my discovery, I was in search of a falafel sandwich and fries. To that end, I took myself off to the East Village again, my good luck of a week before still fresh on the brain. Here I am after leaving Mamoun's Falafel Restaurant, (http://www.mamouns.com/) because there was nary a fry on the menu, hopefully strolling down Second Avenue between St. Marks Place and 7th Street. That's when I hit paydirt at a space a hair bigger than a storefront with very limited inside seating. Struck by the name on the sign, I reverently approach the doors of Pommes Frites, first standing outside reading the menu and eyedropping on what the diners taking up the lone outside table are eating. That's when it hits me that the joint sells fries only, in regular ($4.50), large ($6.25) and double ($7.75), all served in paper cones – how cool is that!!! – with some pretty nifty sauces and garnish, most for a little bit extra, including free Frites Sauce (traditional European Mayo). In deference to its location in the United States, Pommes Frites does offer Ketchup as a free sauce. But among exotic choices for $1.50 are Pomegrante Teriyaki Mayo, Blue Cheese, Sambal Olek – Hot Chili Paste, Peanut Satay and Bordeaux Wine, Figs & Sage Mayo. For $2.25, truffle lovers can get down with Oganic Black Truffle Mayo. Pommes Frites has been doing business for nearly 18 years. I know: decisions, decisions. 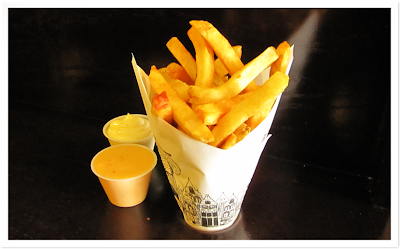 To facilitate decision-making, Pommes Frites offers samples of potatoes and sauces. I select the Frites Sauce with my potatoes sample. Delicieuse! Fried potato lovers, welcome to a little piece of culinary heaven. And heaven appears to cater to the party set, with Sunday-Thursday hours from 11:30 a.m. to 1.a.m. and Friday & Saturday, from 11:30 a.m. to 3:30 a.m. Between swallows of my sample, I ask the counter guy how long Pommes Frites has been in business, fully expecting him to say six months or a year and a half or two years. Are your ready? Omer Shorshi, a former Israeli army paramedic and graduate of the Institute of Culinary Education, opened Pommes Frites 17 years – nearly 18 – ago. Apparently, the place is so popular that it sells the world over merchandise along the lines of Frites Tossers, Salt Shakers, Paper Cones, Cardboard Cones and Cone Inserters. Pomme Frites! Serioulsy, who knew? How is it that I, a devotee of fries, could have lived in Gotham for eight years and been wholly ignorant of Pommes Frites. And, and, and, all of those times that I wanted on my fries Canadian Cured Cheddar Cheese & Gravy, I could have stopped in for a Poutine ($5.50-$11.00)! Clearly, I have to get out more. Fresh cut potatoes at Pommes Frites are twice fried to achieve the crunchiness and softness for which they are known. The fries remind me of the homemade variety I had coming up. Pommes Frites is able to master that golden brown crunch on the outside and soft (as well as done) on the inside because they fry their fresh-cut potatoes twice (in high-quality, gluten-free vegetable oil). The first time they are cooked through. The second time to achieve the golden color and crispness. Yum and yum. Let those who have ears and a love jones for fries take themselves off to Pommes Frites for a transportive experience! 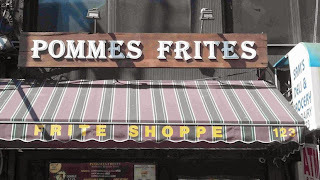 Visit http://www.pommesfritesnyc.com/ to learn more about Pommes Frites.